PDFConverterHQ Toolbar is promoted as a utility that can allow you to convert files from one format to another. Although this may be useful functionality, the program is also known to have serious drawbacks. It uses a deceptive distribution method called bundling. This means that it gets attached to freeware and shareware. In most cases, the potentially unwanted app gets installed without the user’s notice. The goal of the toolbar is to advertise its sponsors and thus earn revenue for its creators. If you do not wish to deal with its symptoms any longer, you should terminate PDFConverterHQ Toolbar without hesitation. 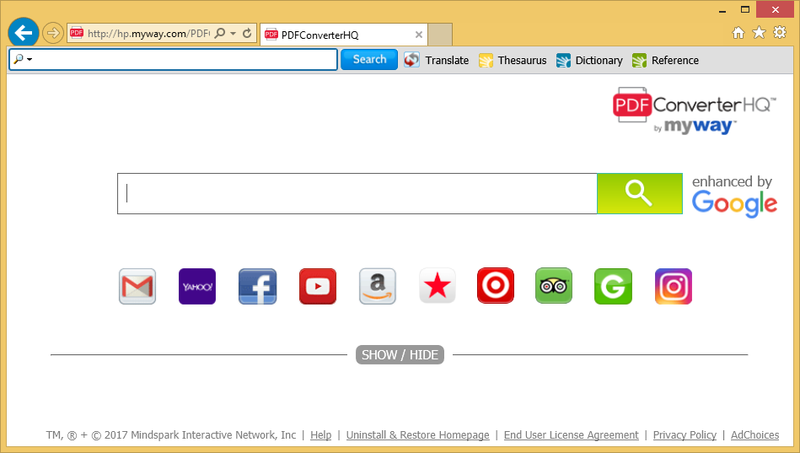 How does PDFConverterHQ Toolbar work? There are several annoying symptoms associated with the toolbar. Once it gets access to your computer, it not only adds an extension to all browsers that you have got installed, but it also changes your browser preferences. Your home page and default search engine may get replaced with Home.tb.ask.com. Ask Search may be a legitimate search engine, but you should know that it will show you results containing sponsored links. It may present you with different ads on its main page as well. As the main purpose of the app is to expose you to advertising data, it will insert pop-ups, coupons, links, banners, and other ads into all sites that you open. These ads will undoubtedly slow down your surfing. More than that, they may contain false information or links to corrupted pages. It is important not to believe everything you see when it comes to the ads, because if you do, you will end up falling for an online scam. This could result in dire consequences like infecting your PC with malicious software, wasting money on bogus products, and so on. If you wish to improve your online safety, there is no doubt that you should get rid of PDFConverterHQ Toolbar without hesitation. How to remove PDFConverterHQ Toolbar? You can delete PDFConverterHQ Toolbar from your browsers manually or automatically. If you choose to erase PDFConverterHQ Toolbar manually, you will have to uninstall it from your computer and then edit your browser settings. Instructions below the article provide more details on how you can complete these tasks. You are welcome to use them. The alternative (and the more effective) solution is to remove PDFConverterHQ Toolbar automatically. This can be done with the help of a malware prevention and removal tool. You can acquire the security software from our page. It will perform a full system scan ans detect not only the toolbar, but all unwanted components present on your PC. Once the scan is finished, the anti-malware will eliminate PDFConverterHQ Toolbar along with other unsafe elements. Moreover, as the malware remover comes with multiple beneficial features including real-time online protection, it will also help you keep your computer shielded from other Internet-based parasites you may encounter in the future.